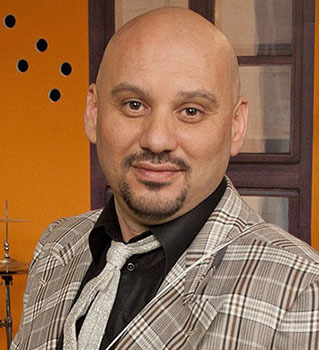 Dragan Ristić was born in 1972 in Valjevo/Serbia. He graduated from the Faculty of Dramatic Arts, University of Belgrade, Department of Management and Theatre Production, Radio and Culture. He graduated from the same University with a Master’s degree in “Theory of Drama Art and Media” in 1999. He is a founder of the band KAL—recognizable by its musical style Rock ‘n’ Roma—in which he appears as lead singer and guitarist. In addition to many years of music engagement and participation in numerous music festivals in the country and abroad, he was engaged in film and theatre as a producer, actor and composer. Engagement includes Emir Kusturica’s film “Black Cat, White Cat” (translation and music), Romani Theatre Raidna from Belgrade, Romani Theatre Vareso Aver from Budapest (the plays “Jacques, or Obedience” by Eugene Ionesco and “Blood Wedding” by Federico Garcia Lorca). Dragan Ristić has been a director of The Romani Cultural Centre in Belgrade since 1998. He has worked for Radio Belgrade’s Romani language program as a journalist, editor and translator. Dragan Ristić is the author of the publications “Romani Media in Yugoslavia: Development and Opportunities” (1997) and “History of the Theatre Romen” (1999). Previously he also worked as a Romani language practice coordinator for the European Roma Rights Centre (ERRC). He speaks native Serbian and Romani, English and basic Hungarian.